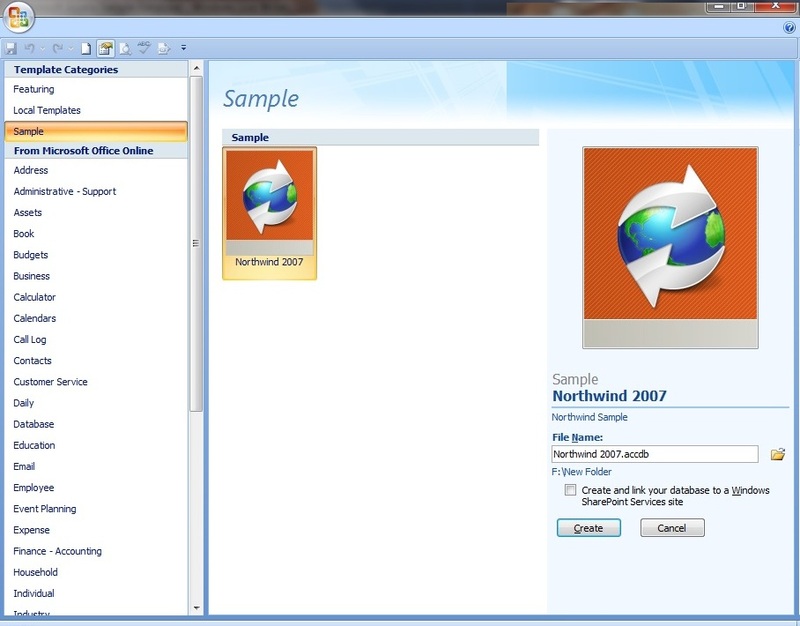 During installation of Microsoft Access 2003 or earlier versions, the NorthWind.mdb sample database also will be installed on your computer automatically. The sample database is very helpful for those who are starting with their self learning practices of Microsoft Access. Those who are migrating from Microsoft Excel Worksheets and tables are created in line with what they have practiced in Worksheets, find themselves faced with lot of issues. In fact, Excel itself have database management support, even though they are not as flexible as Microsoft Access. Excel Users can browse for database basics in Excel Help documents to set up a database in Excel and learn simple data organizing & retrieval methods, like sorting, searching, filtering and so on. This not only helps to learn database basics but also will help to organize Excel worksheet/database in such a way that they can be easily linked/imported into Microsoft Access, if need arises at a later stage. Coming back to the sample database creation in Microsoft Access 2007, it doesn't create a sample database (Northwind.accdb) automatically in your computer. But, you can create one yourself from the sample Templates provided. It contains all the tutorial materials you need to learn Microsoft Access. You will find several Database Template Categories displayed at the left panel and Featuring Category is selected by default. In the middle window, the template Blank Database displayed and other templates designed for specific purposes. On the left panel find the Sample Template category and select it. Click on the Northwind 2007 Template. The database will be saved in the active folder by default. You may change the folder by clicking on the folder icon to the right of the database file name. Click Create Button to create the sample database in your preferred folder specified. Always use the sample database as a reference point for all your issues regarding Table designing, setting up Relationships, Queries, Forms, Reports and Macros designing. Do few trial and error practices on the specific task you are trying to accomplish, with whatever knowledge and ideas you have. You will get better insight into the task you are trying to design and you can find solutions in most cases yourself. If you are not able to do it then with the trial-and-error background you will be in a better position to explain your specific issues and seek help from other sources.